We designed a scheme that is fresh, uplifting, with a practical approach in mind for a young family. THE PROJECT: Maple Ridge Residence. 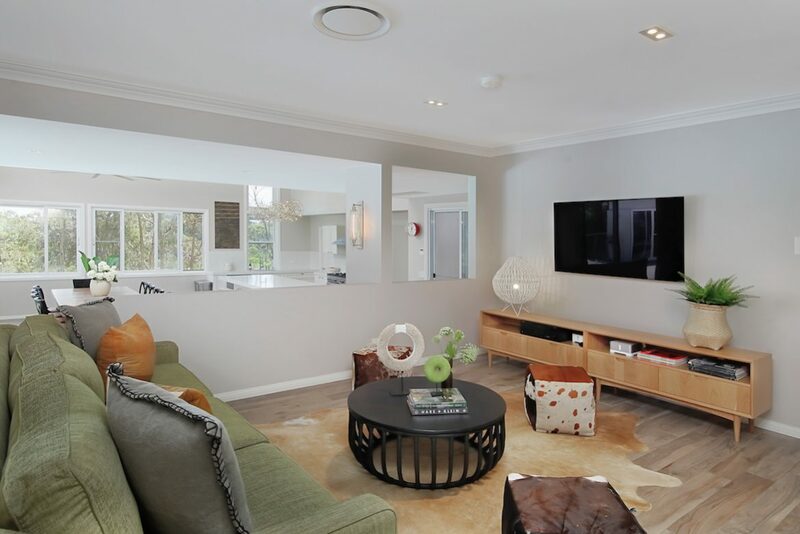 Recently relocated from overseas, this young family purchased a newly renovated family home set in a rural suburb of Sydney. 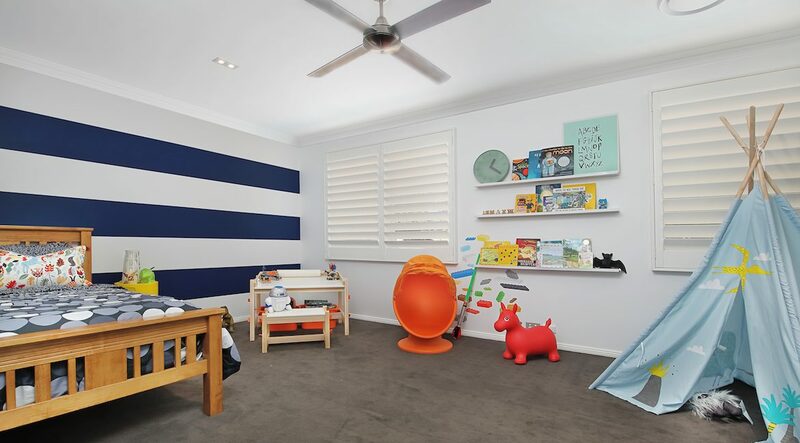 The owners, a dynamic family with two young sons commissioned us to furnish and decorate their new nest. It was a blank canvas for us to work with. We were asked to come with a decorative flair for 4 of the 6 bedrooms, the entry and family dining area, a lounge and outdoor space. The colour scheme throughout the home was kept so was the floor finishes. Additional furniture, art and window coverings where to be added to our design. We understood the task ahead to design a scheme with a fresh, uplifting and practical approach in mind, and to create that personal touch that reflects this gorgeous family. The entry area is a large open space that leads to 4 different sections of the house. This large open space needed to have a strong impact on entry as it felt overwhelming big and empty once past the front door. For this grand home, we designed a visual feast first on entry with a lush wallpaper, framing a set of glass doors which overlooks stunning Australian landscape views in the background. The large custom sisal rug ties the 4 areas together. The Contemporary Aboriginal artwork was selected to bring colour and lovely organic flow to the room. The entry area gave us a good flow to design the rest of the house. The key to good design for this project was to select a few items but of great importance for each section. Forming a solid base for which our client can add other pieces as the family grows. Concept Presentation for the entry area. ENTRY – Defining the entry space…making it chic and inviting, a space that is always in good order. The dark, bold and textured sisal rug ties this entry area together by linking the three walls. Unique accessories like the porcupine mirror add a fun touch; underneath are the two benches to store shoes. The wallpaper has been selected to enhance the size and scale of the room and the colours work beautifully with the existing scheme of the house. A rustic sideboard completes the look. A large Bush Plum painting from the Australian Contemporary Aboriginal artist, Belinda Golder Kngwarreye is bright and uplifting. Concept Presentation for the lounge area. LOUNGE – This space is inspired by the feel of rustic chic! It has warmth, comfort and charms. 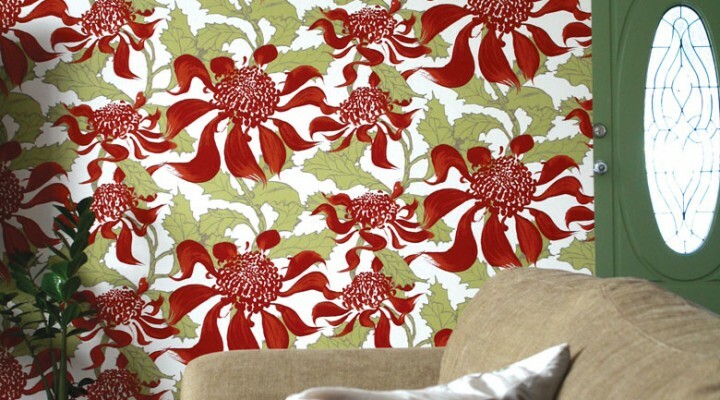 Creating a style that is tactile, comfortable and for all to enjoy. The sofa seats 4 with ease, the upholstered fabric in apple green colour is uplifting. The side ottomans in cowhide can be used for seating or as a footrest. 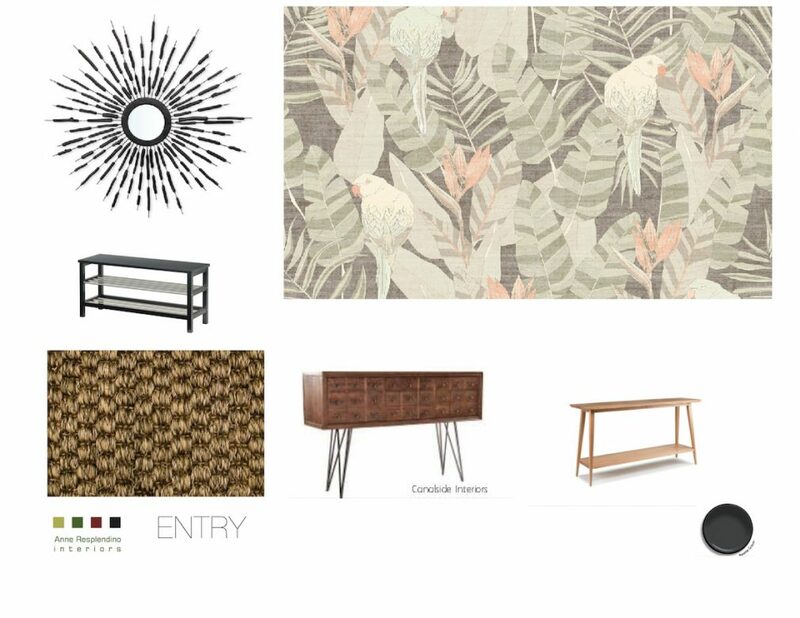 The dark coffee table is rustic to continue with the entry scheme. 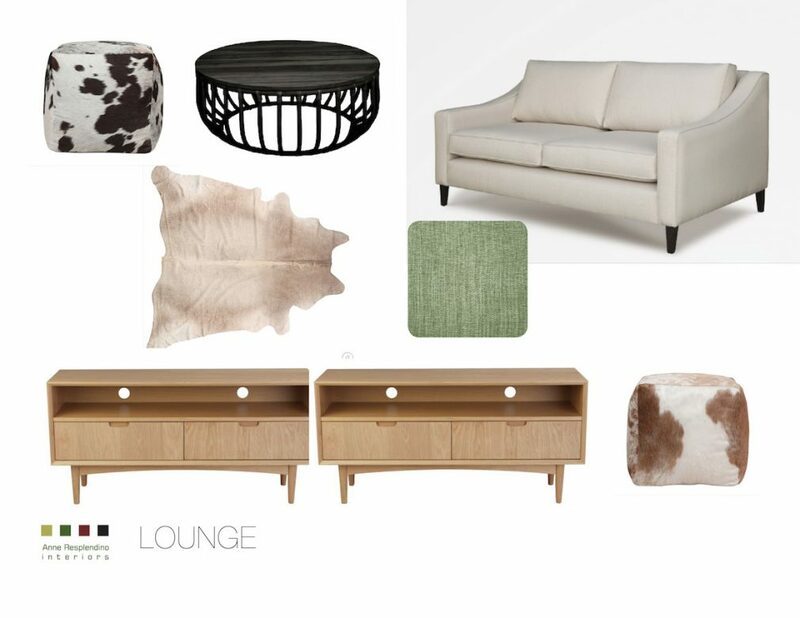 Two entertainment units sit side by side, the cowhide rug completes the rustic feel. Concept Presentation of the dining area. 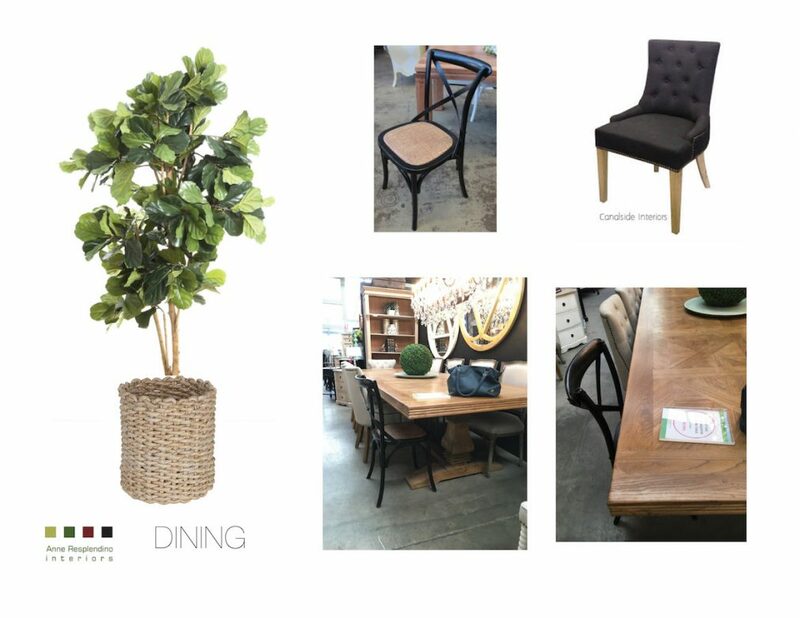 DINING – It’s a large-scale dining for a convivial and relaxed atmosphere, designed for everyday living. The elm dining table has a natural patina with a beautiful parquetry top. Complemented with dark cross timber chairs and two upholstered chairs in charcoal linen that sits on each end. The addition of greenery softens the grey tones of the room, we suggested a tall fiddle leaf tree, a rubber tree plant, aglaonema and sansevieria species. 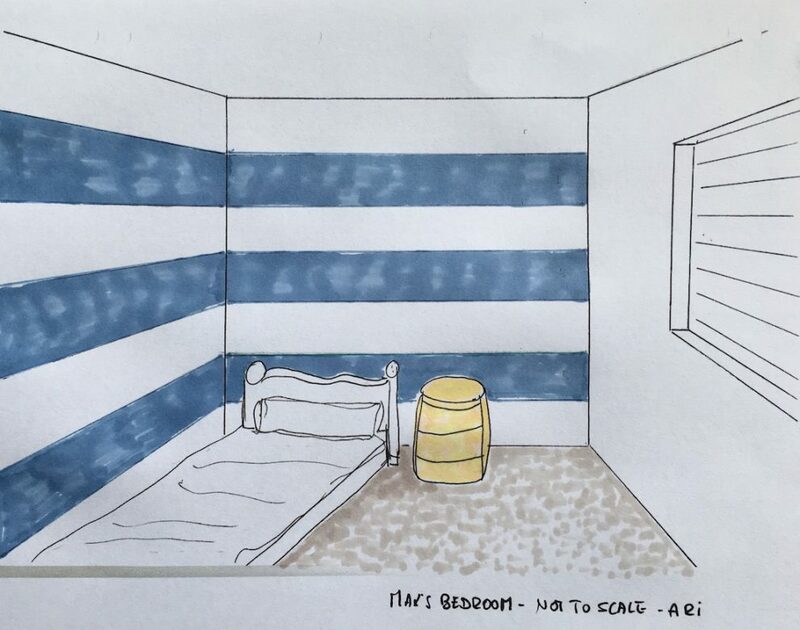 Concept Presentation for the child’s bedroom. 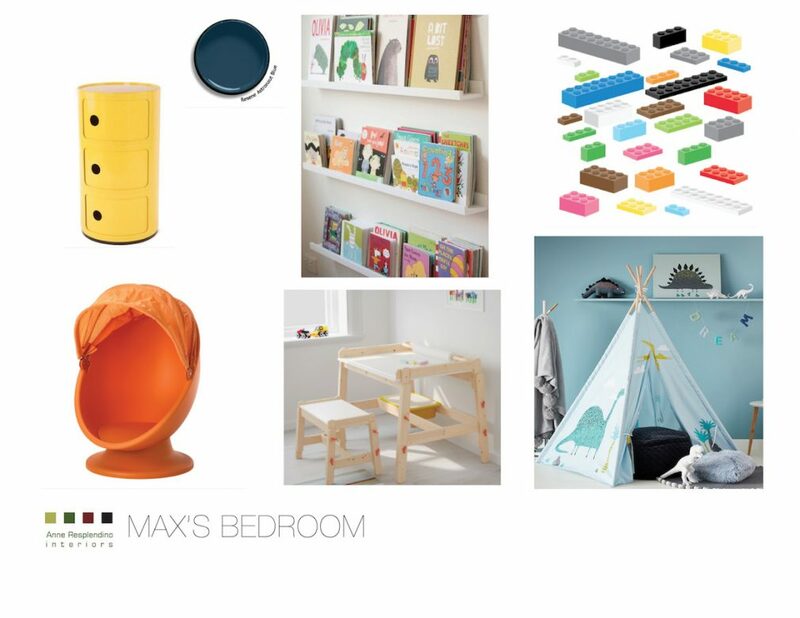 MAX’S BEDROOM – A space to read and rest in a cheerful setting. 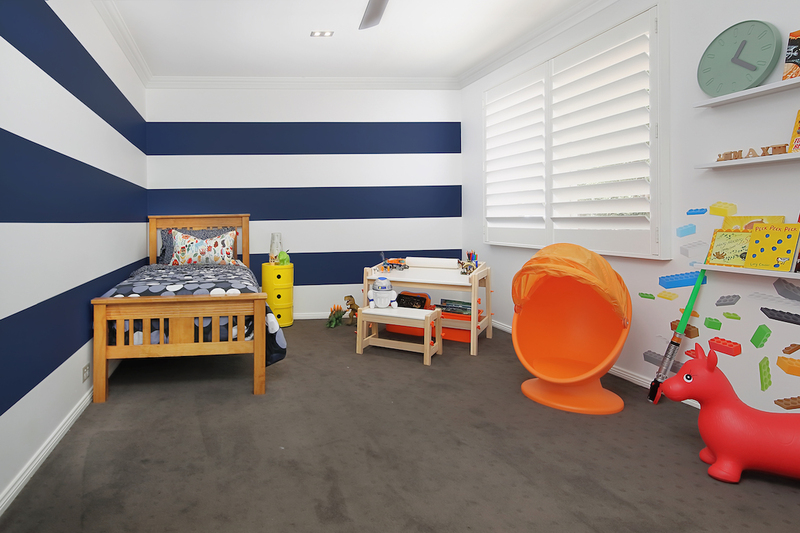 Bold stripes painted in ASTRONAUT from RESENE paint create a cocoon effect on the two walls by the bed. We added a bright yellow side table, wall mounted floating bookshelves to display Max’s favourite books, blocks of lego stickers to add colourful interest on the wall, an adjustable desk and bench to read or create some artworks, a teepee house to hide in with a book or sit in the swivel chair with a bright orange hood creates a positive environment to grow and be happy. The scheme is to be personalised to Max’s enjoyment where he will feel comfortable to have his own little haven. 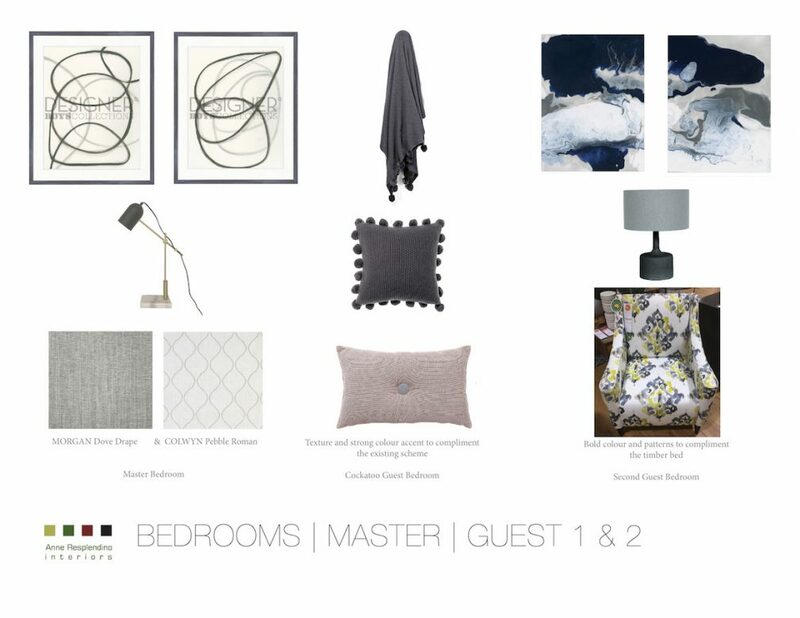 Concept Presentation for the Master Bedroom and Guest Bedroom 1 & 2. 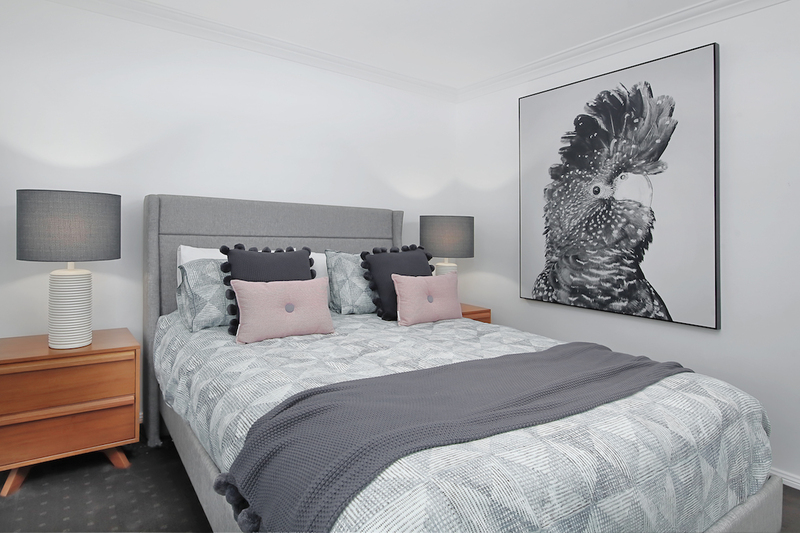 The Master Bedroom – Bringing a Scandinavian feel with a soft colour palette and organic shapes. The custom-made drapes are in a neutral tone and the soft Roman blinds create a neat texture with its repetitive patterns. 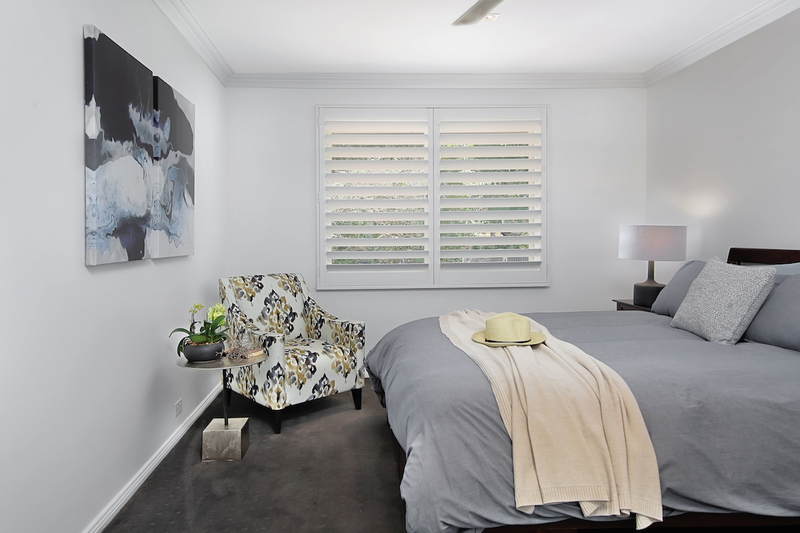 Guest Bedroom 1 – Adding texture and stronger colour to complement the existing young and fresh bedroom. Guest Bedroom 2 – Bold and rich statement for the second guest bedroom. The armchair has large patterns with indigo and mustard colours. The room has canvas prints with deep blues and misty whites adding a lively touch to the room. 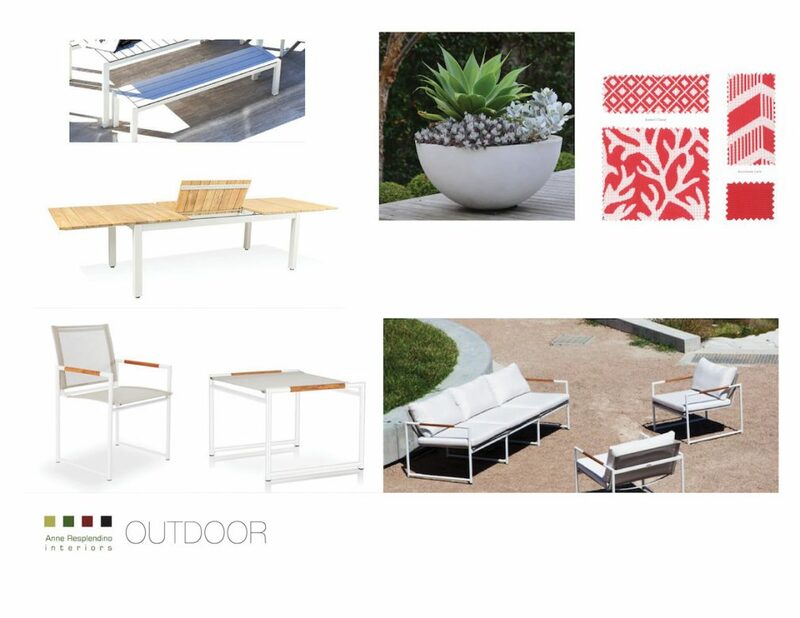 Concept Presentation for the outdoor. 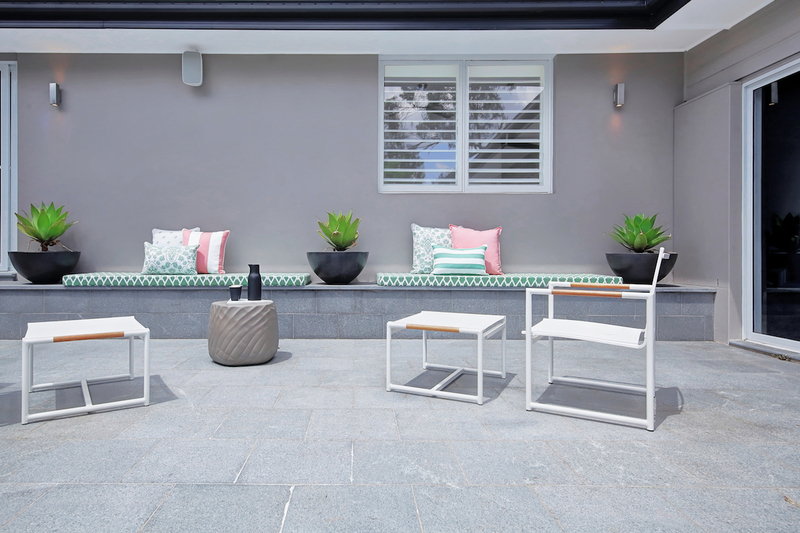 Outdoor – Modern, fresh and clean lines to complement the courtyard scheme. 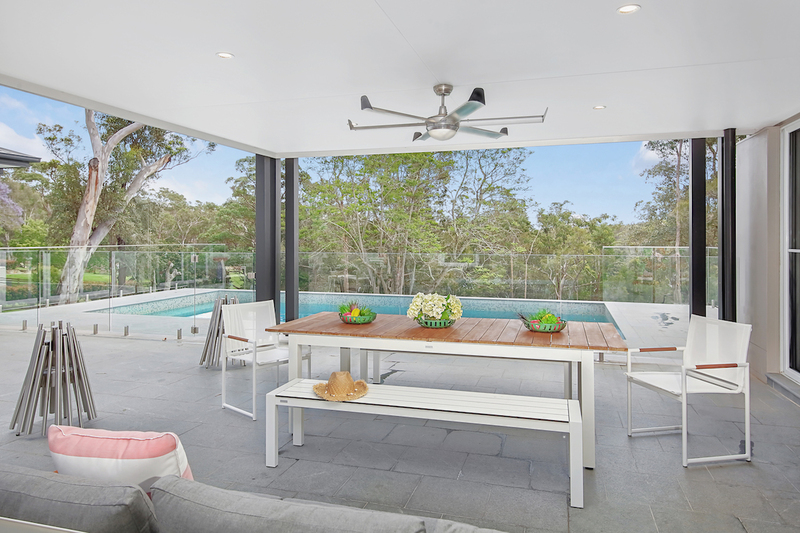 The outdoor dining table top is teak and adds some warmth to the grey scheme of the courtyard. The teak touches are repeated as a detail on the armrest of the chairs and sofa. The Sofa and club chair can be used without the cushions. The footstool can be used as a side chair with a tray on it. 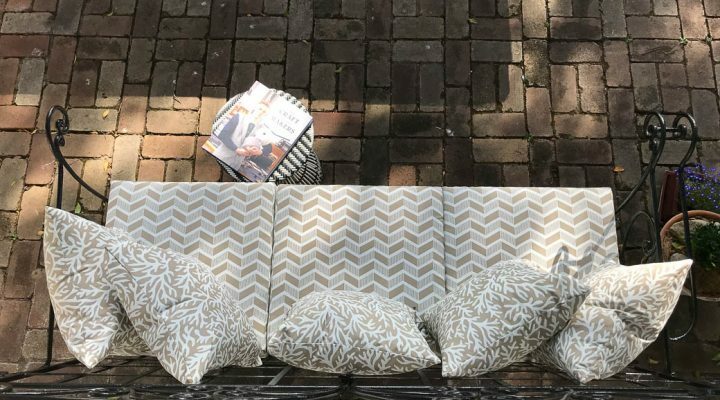 To dress the stairs and to add more seating, we placed two long custom made cushions with strong coloured patterns. We added 3 large phow bowls in charcoal accompanied by succulents for a fresh and lively scheme. A set of STIX firepits in stainless steel is a great way to add atmosphere when lit up. Easy to use and environmentally friendly as it consumes sugarcane ethanol as combustible. For professional design services, please get in touch with us.